Follow these easy tips to get road map veins in time for the summer months. Summer is right around the corner and that means you should be six-pack ready. In addition to having a tight midsection, there is one other element that can add to your physique -- being vascular! Veins are the super highway for carrying blood but it takes real work to make them show. Big muscles with a road map of veins are the icing on the cake to a great physique. The question remains, how do you get more vascular? When veins are bulging out on someone it is a sign that they did their homework. In order to have veins that protrude out of your skin like a garden hose, you have to have low body fat. Body fat is that nasty layer of fat between our muscles and our skin. The thicker this layer, the less muscle definition and veins you will see. This is how you can tell if someone is truly lean enough. If you want to show off your veins, your body fat should be lower than 8 percent for men and around 18 percent for women. At those levels, the layer of fat between the muscle and the skin is very thin. Having lower body fat will reveal more muscle separation and will bring out those veins. If you have good definition at 12 percent bodyfat, continuing your fat loss until you reach below 8% will reveal more striations and more veins. Genetics play a role though, every person is different. Some people have more predominate veins that pop out at a higher bodyfat. Others have to diet much harder to have veins that show. Genetics also play a role in where your veins stick out from. You may have leaner arms and your veins may show faster there then on your stomach which may hold more body fat. Some people have more pronounced veins and others have smaller more hidden ones. Bottom line; you cannot control your genetics but if you want more vascularity you need to diet harder. The lower the body fat number the higher your chance will be at being vascular. Does Training Bring Them Out? Training for a pump can bring more blood flow to an area, which will make the veins in that body part more pronounced. Unfortunately, the effect is temporary. 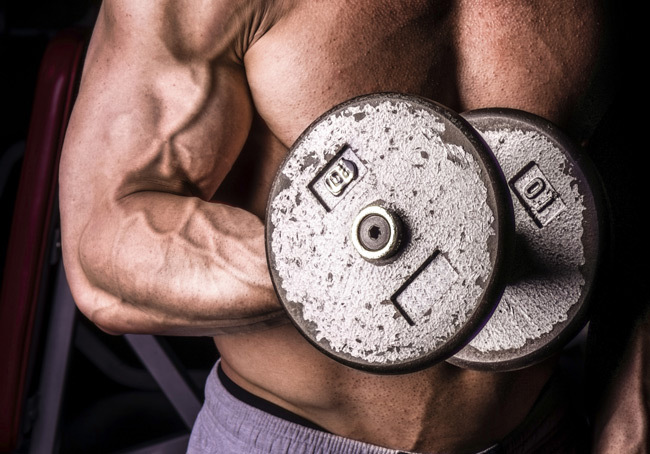 High rep, high volume training works better for bringing out vascularity. Lower rep, lower volume training has its place for building muscle but will do nothing to help you get a pump. Training for vascularity does not really exist. As stated earlier the only method to revealing your veins is to lower your body fat. Focus on training with progression and on building slabs of muscle. Being veiny doesn't really look appealing unless you have the muscle to back it up. One technique that has helped increase vein visibility is blood flow restriction training. Blood flow restriction may help to improve vein size and capacity due to the pooling of blood during the restriction.